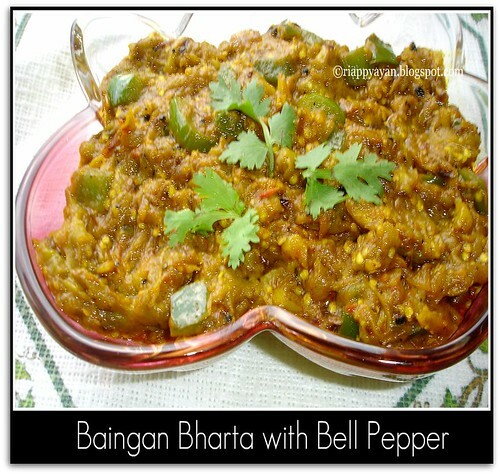 Baingan Bharta is a roasted eggplant dish, originated in the villages of Punjab. Baingan Bharta is a healthy dish - eggplant/baingan is the main ingredient here, which is low in fat and sodium and high in dietary fiber, vitamins C and B6, magnesium, phosphorus and potassium. Eggplants are roasted on open flame in this recipe to get a smoky flavour. Add to that tomatoes, green chillies and onion and you've a low calorie mighty nutritional punch in one single dish. Lemon juice : 1/2 tsp. or Amchur(dry mango) powder : 1 tsp. Roasting Eggplants : Slit from the middle upto the stem, keep the stem intact. Then brush mustard oil all over the eggplant and sprinkle little salt over it and stand it on a burner of a gas stove over a medium flame. After one side is charred(turns black), turn to the other side holding the stem. Do the same thing until all sides up to the bottom of the eggplant is thoroughly charred and the flesh of eggplant is cooked. Just after the whole bringal is charred, drop into a bowl of cold water, it helps the charred skin to come off easily. After 5 minutes, take out the skin. Cut the stem out and mash the flesh or pulp thoroughly, (there shouldn't be any lump left) and keep it aside. Heal oil in a pan, temper with cumin seed. When they crackle, add onions. Saute for a minute, then add capsicum and saute with the onions. Then add grated ginger-garlic, green chillies. Saute again for 1-2 minutes. Then add tomatoes and saute until tomatoes get pulpy, then add all the powdered spices. Cook until oil seperates from the spices. Add the mashed eggplant and mix well. Season with salt and saute for few more minutes. Lastly, I love to add little lemon juice or amchur powder, as it just gives a little tang in the dish and blends the spices well . Mix well and remove from heat. Nice and lovely combination.. Yummy !! Wat a flavourful and delicious dish,loving it..